The Cloud of Unknowing is a well-known fourteenth century anonymous mystical text in Middle English. (As pretentious first sentences go, in a blog on photography, that’s not at all bad, but let it pass). I read it years ago (in a Penguin edition) and not much of it stuck — I hadn’t spared it a moment’s thought since, and would struggle to tell you much about it beyond the title. But it’s such a great title that I’ve carried that around with me. Now I feel I have a use for it. I have kept a few of these pictures by Alejandro Guijarro on a bad slide-show on my computer for some weeks and they stick most wonderfully in my head. 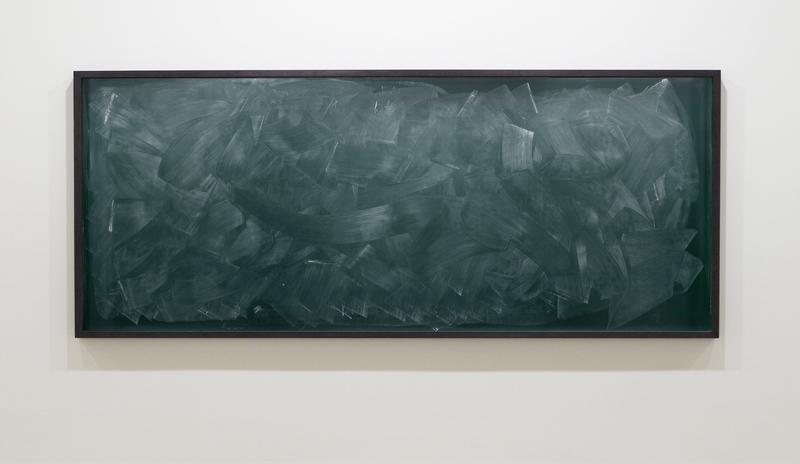 They’re from a series called Momentum, and they’re simply pictures of blackboards. When he exhibits them, the photographer carefully reproduces them precisely to scale: he shows them at the size of the original boards. Some of the originals are in lecture theatres, others in the studies of researchers. But they’re not just any blackboards: they are in some of the most famous physics and maths teaching institutions in the world. 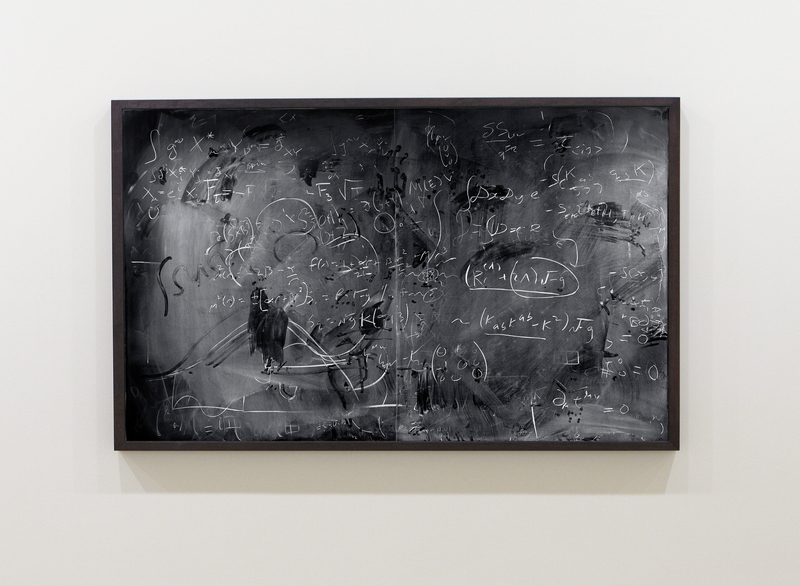 They are blackboards used either to help explain quantum mechanics or to resolve quantum problems. That is relevant. Quantum physics represents a black hole of mystery to most of us. If we know a rudimentary minimum — say that adding energy to certain systems can cause them to jump from one state to another rather than progressing smoothly in proportion to the increased energy; or that certain phenomena take the form of both waves and particles at the same time — we are likely to be well satisfied with that. Richard Feynman was a great populariser of physics and believed in being comprehensible whenever possible, and he wasn’t only joking when he said “I think I can safely say that nobody understands quantum mechanics.” Since he had a Nobel prize (1965) for his contribution to the advance of quantum electrodynamics, he knew what he was talking about. Even rudimentary awareness of quantum thinking is terrifying simply by the nature of the people who do it. Max Planck. Erwin Schrödinger. Feynman himself. Louis de Broglie. Einstein, of course. Nils Bohr laid the foundations for some of it. These are not brains to trifle with. Remember the story of Schrödinger’s (famous) cat, which is itself utterly incomprehensible to ordinary non-physicists, since it asks for a cat to be alive and dead at the same time, was a simplifying parable dreamed up as an explanation of something even more dreadfully obscure. Yet quantum thinking is no longer in question. We’re assured that quantum reasoning is central to the modern world, to progress, and to prosperity. The areas where quantum theories are applied are perfectly non-terrifying. Light-emitting diodes. Lasers … These might once have been the stuff of Flash Gordon but they’re hardly unfamiliar now. The erasures mark the transfer from one state to another. 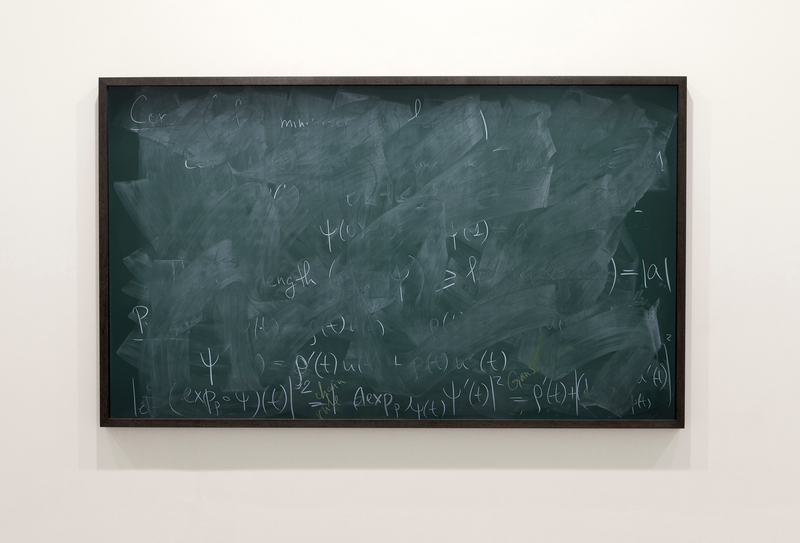 Each one, in fact, since it’s actually quite difficult to wipe a blackboard completely clean, represents a number of previous states piled on top of each other, the shadows of each both informing the next and obscuring them. These palimpsests are of course completely appropriate to the subject matter. Quantum is lots of things, but some notion of the palimpsest is certainly part of it. (Palimpsest is the term for writing that is barely discernible on manuscript that was erased and re-used: the all-but vanished layer being sometimes historically more interesting or more important than the legible one on top). Separately, these are also pictures of the functioning of a priesthood. The strange incantatory marks are in a language known only to the inducted. If you were an English graduate or a musician (or a writer on photography) you could stare at these with as much patience and as a good a lens as you liked and still not have any chance of understanding what the marks actually say or said. It is important that they meant something: these are not abstract marks, at all. Yet the pictures tend towards abstraction. Or if not towards abstraction itself, then towards a kind of metaphor so oblique as to be all-but abstract. They are certainly not only pictures about blackboards. They hover exquisitely between direct reference and allusion. Wang Qingsong’s Follow Me (2003) is itself a subtle picture, being at least as much about the business of not learning and difficulty communicating as their opposites. But Follow Me is like a commercial poster compared to the Momentum series: effective enough, but bluntly so. As well as being neat reflections on quantum, the blackboards also represent something else about the way science itself works. It was Newton who described his own contribution to progress by saying that he was merely a pygmy standing on the shoulders of giants. You advance a theory, check it, it maybe computes perfectly with data known at that time, but then other facts come to light, and someone has to revise your theory. Rubbing out the parts which don’t work any more is exactly how science advances. These blackboards are beginning to show themselves capable of carrying quite a metaphorical load. 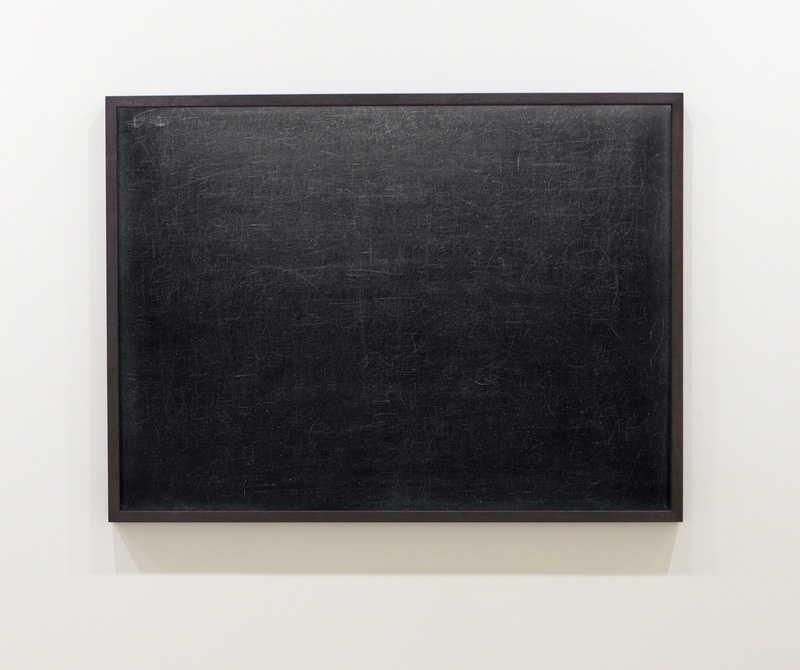 There’s more: in the history of modern art, few notions are more loaded than the blank. John Cage’s famous 4:33 was far more than the pretentious absurdity it’s sometimes caricatured as. By inviting a player to sit at the piano but hold back from playing any notes, Cage filled the silence with the ambient noise, and with all sorts of echoes, too. It’s impossible to hear (is that the right word?) 4:33, still now, without one’s head reverberating with music and thoughts about music. You can trace this idea quite a long way back: Robert Rauschenberg’s White Paintings are the source that Cage himself acknowledged, but Rauschenberg himself was taught by Josef Albers, and so on. There’s a strong link here through the Black Mountain College, but I don’t think this notion of the pregnant blank is unique to any group or place. 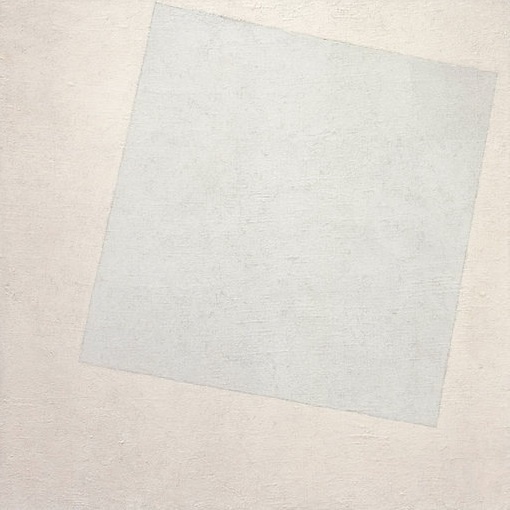 Malevich had painted White on White in 1918. 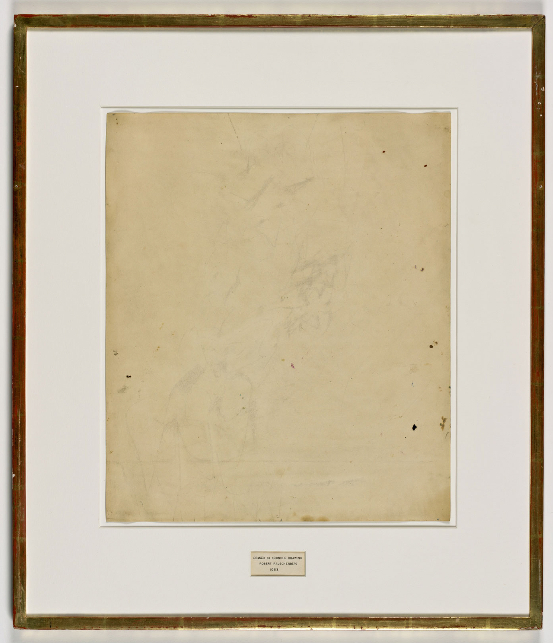 It was Rauschenberg who made a famous work called Erased de Kooning (it dates from 1953). That wasn’t just vandalism or iconoclasm, either. It was made with de Kooning’s permission and help, for a start, and it was a complicated and subtle reflection on the act of painting itself, on reaching grand status as a painter, and on the process of questioning artworks. Guijarro’s blackboards are not blanks. Neither 4:33 nor the Erased de Kooning were really blanks. They were simply blank enough to invite us to populate them ourselves. We’re not far from Mark Rothko’s soulful invitations to meditation, but nor — a bit more fancifully — are we far from the late Turner’s swirling contemplation of light itself. Light, by the way, is best described in quantum terms. It still helps to think of it in terms of waves; but it can also be seen to act in terms of packets of tiny subatomic particles called photons. That’s part of Guijarro’s thought, too. Alejandro Guijarro described somewhere how one of the more patterned blackboards was actually created by a caretaker or janitor, rubbing the board after the lecturer and audience had gone. I like the unconscious creation of that (or why not imagine the caretaker deliberately took pleasure in the measured coverage of the eraser?). I like even more that the photographer has to be credited entirely. These are not just records of something noteworthy or important that the photographer loyally transcribed from the real world to the two-dimensional one. These are pictures full of weight and meaning, but there was neither weight nor meaning until the photographer put them there. In other words, photography here is not a dependent business, but a fully generative one. There were only marked blackboards until they became photographs. The labour of criss-crossing the world to these august institutions, seeking permissions (and, I guess, seeking blackboards themselves, for they can’t be all that common any more), shooting pictures at odd moments when the lecture theatres were not in use – all of that is the common currency of successful photographic formulae. It’s logistically demanding, and needs to be got right. But the results that you see here are far beyond simply resolving problems of access and display. 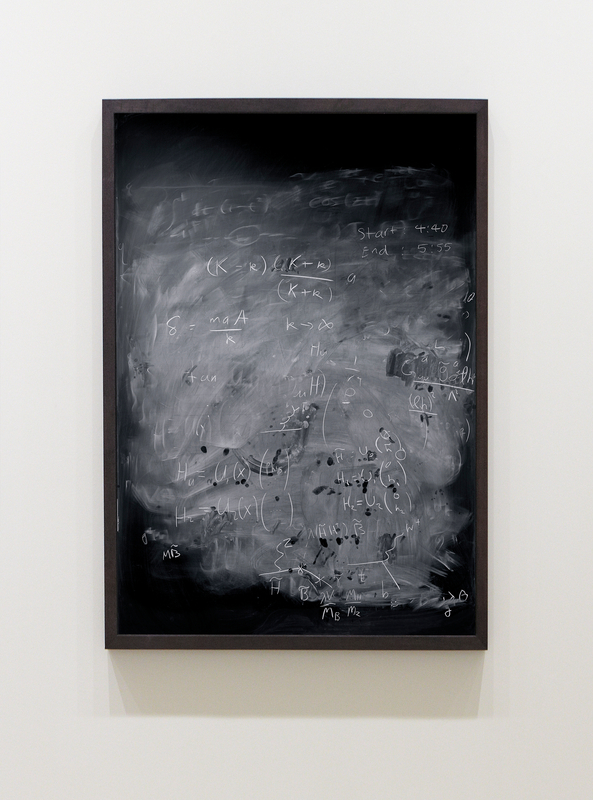 I’m fascinated that this simple gesture of rubbing out a blackboard can come to stand so well for so much. I also want to use about them a word that has almost wholly disappeared from contemporary photographic criticism: they are extraordinarily beautiful things. Photography rewrote the rule book about beauty long ago, and continues to do so. But the word still stands. How else can we describe pictures which are so attractive in their airy clouds of chalk dust, and which at the same time so perfectly marry what they’re of to what they’re about? I regard these seemingly simple photographs as rich invitations to think. As a profoundly ignorant non-scientist, I regard them as pictures of my own cloud of unknowing. This entry was posted in Photography and tagged Alejandro Guijarro, Black Mountain College, Erwin Schrödinger, J.M.W.Turner, John Cage, Kazimir Malevich, Mark Rothko, Max Planck, Palimpsest, Quantum physics, Richard Feynman, Robert Rauschenberg, The Cloud of Unknowing, Wang Qingsong, Willem de Kooning by Francis Hodgson. Bookmark the permalink. Randy West did a chalkboard series in 1997. The execution of Guijarro is impressive. Thanks for your nuanced analysis. I saw several of the works from this series at an art fair in San Francisco and was very impressed. Many of the points you raised were floating in my mind as I viewed them – authorship, indecipherability and ciphers, intent and accident, the nature of the quantum world and the role of light linking photography and physics. I look forward to seeing more of Guijarro’s works.